Home Blog Aliens Stole My Clothes! Aliens Stole My Clothes! is a light hearted competitive multiplayer brawler video game for everyone. Checkout the video below to see more! In the game, aliens are abducting innocent citizens of Earth and returning them back to terra firma wearing only their underwear! Game players must battle with each other across different themed environments in order to reclaim their clothes and their dignity. Be warned however, the aliens could return at any time to continue their mischievous mayhem, turning the tables in an instant! The fun video game features a wacky cast of customisable characters and a wide range of oddball weaponry. The aim of the game is to be the highest scoring player when the battle timer reaches zero. 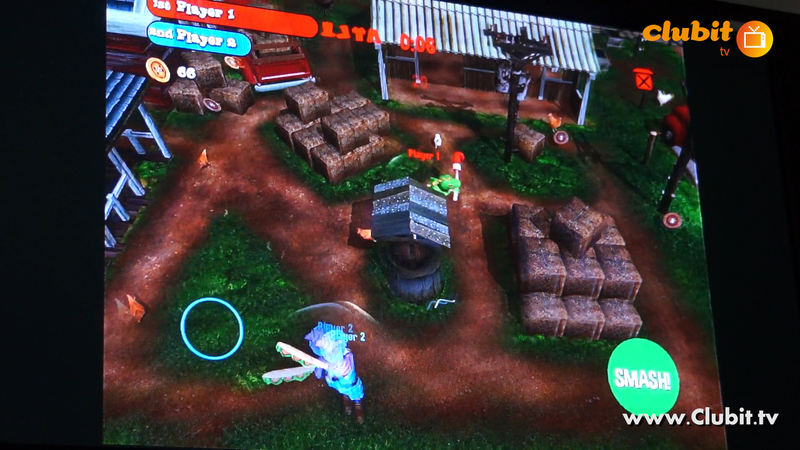 Players win points by reclaiming their clothes (or stealing their friends clothes), battling other players and fending off aliens. Power-ups can be used to gain the upper hand with invulnerability shields, speed boosts, attack multipliers and many more that can swing the balance of a battle! In the midst of all the clothes swapping frenzy, players are guaranteed to look ridiculous – however, all that matters is that once the dust has settled, your number one! The video interview was filmed by Clubit TV at #GMY8 (Ga-Ma-Yo) in Leeds on 30th April 2015. In the video Daley johnson talks with the MD of Red Kite Games Simon Iwaniszak who explains more about this awesome game. Red Kite Games are currently looking for a publisher for the Aliens Stole My Clothes! game.